Narration of the classic tale is enhanced by lovely illustrations by William Denslow (illustrator of the original Wizard of Oz series). The app features pop-up book-style pull-tabs, spin-wheels, and page elements that react to touch. “O Christmas Tree” plays in the background, too. An especially great deal for iOS devices and lots of fun for smaller kiddies. A rich version of the holiday special, this book combines the best of traditional storybook with animation and touchscreen interaction. 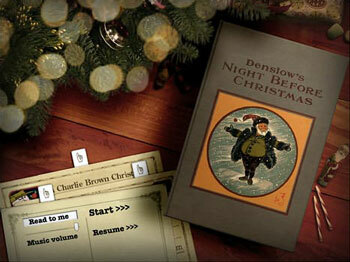 It features narration by Peter Robbins, the original voice of Charlie Brown, plus classic and original dialogue. Interactive bits include the ability to play Schroeder’s piano, go caroling with the choir, and decorate your Charlie Brown's iconic little Christmas tree. This charming app is the gold standard for all kids interactive books. 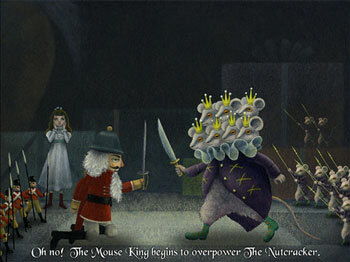 Introduce kids (and grownups) to the classic, Nutcracker Ballet with this beautifully illustrated and animated interactive storybook version of the Christmas classic. The app blends original artwork by Yoko Tanaka with sections of Tchaikovsky’s score. Melodies include Dance of the Sugar Plum Fairy, Waltz of the Flowers, The Nutcracker March and many more. Pesky zombie elves are hell bent on destroying your Christmas presents. They’ll vomit, headbutt, and smash everything under the tree if you don’t blow the evil little critters away. This cheeky fun is obviously not for kids who still believe in Santa… or zombies. 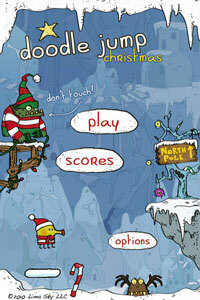 This festive, holiday version of the blockbuster app, Doodle Jump uses the same, motion-driven controls, but adds graphical touches. This version features a snowy environment, improved graphics, and the tricky Chill-Breath Monster who will freeze you on the spot if you’re not careful. The ingenious game app that melds brilliant physics, tricky levels, and bright, endearingly colorful graphics now is free and snugly wrapped in winter visuals. It should keep kids captive and quiet during holiday travels. The new Angry Birds Seasons update, Wreck The Halls, has just landed on and comes with 25 new levels that include presents, gingerbread cookies and bells to get you in the spirit. Fully destructable Christmas lights and other goodies are in effect, too. And, of course, the birds and pigs are all dressed in holiday-themed attire. Even if you live in the tropics, you can make your holiday photos look like you’re in New England. 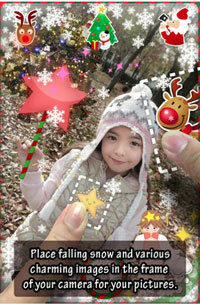 Add light to heavy snow, ornaments, presents, antlers and a variety of other Christmas flourishes, then upload directly to Facebook or Twitter.